This rugged basin formed by Hesperus (13,132), Moss (13,192), Babcock (13,149) and Spiller (13,123) gives rise to the headwaters of the South Fork of the Mancos River. The area is raw, rocky and primitive in the extreme. Great walls and steeples of stone rise around one in a long, horseshoe-shaped basin. 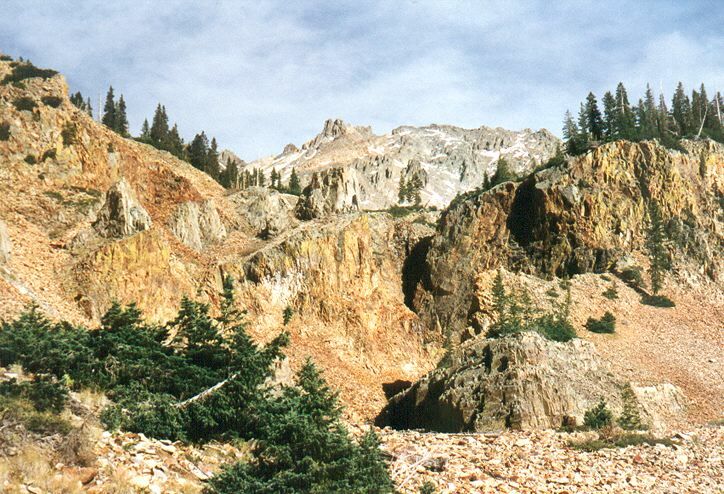 Throughout the La Plata Mountains, igneous sills like the spires of Mount Moss intruded into overlying Pennsylvanian sandstone and buckled the strata. Not having walked in on any known path, our camp was quite secluded and we saw no one for three days. Solitude can be harder to find than you might think, even out here. Meditation becomes natural in the purity of this silence allowingus to see aspects of the world that we do not often notice. The following is from Padma Samten in reference to our trip to Hesperus in 1996. We park the VW van, pull on our packs and lock up. Shugchang explains that we will walk up the valley on the right flank, and end up near the high end of the basin. We move along, fanning out. There's a fast moving stream, the South Mancos, at the bottom of the valley. Off we go. It is a strenuous climb along a steep hillside, through tall forests without a path, then across rock slides of flat boulders. My daughter turns right and climbs higher up the slope, having heard voices up that way. The last thing I heard from her was, 'Go up!' Soon, I am separated from the group and grow apprehensive, want to catch up, and feel a little desperation creeping in. I hobble over to the rock slide and perch myself in the sunlight, grimacing in its warmth. A storm is brewing and the wind is picking up. I sit there for a little while and then decide to pull out my trusty whistle and sound out. Having heard my whistle and calls, Chödön responded; I heard the first call but the wind swirled took over and I heard no more. She had decided to catch up with the rest of our party and get help. I felt abandoned. Why would I hear a response to my whistle, then no one show up? Now I'm getting pissed. Lord, have I got some issues around feeling left behind! As my knee swells, apprehensively, I notice the storm moving in and wonder how much further I can get with my injured knee? I don't know how far up the valley they've made camp, maybe I should hobble back to the van and hole up there... Dumb idea! There's good reason for the agreement to stay put, pull out an emergency blanket, or foul weather gear and call out with the whistle now and then -- hang in, keep the faith, they'll be back.